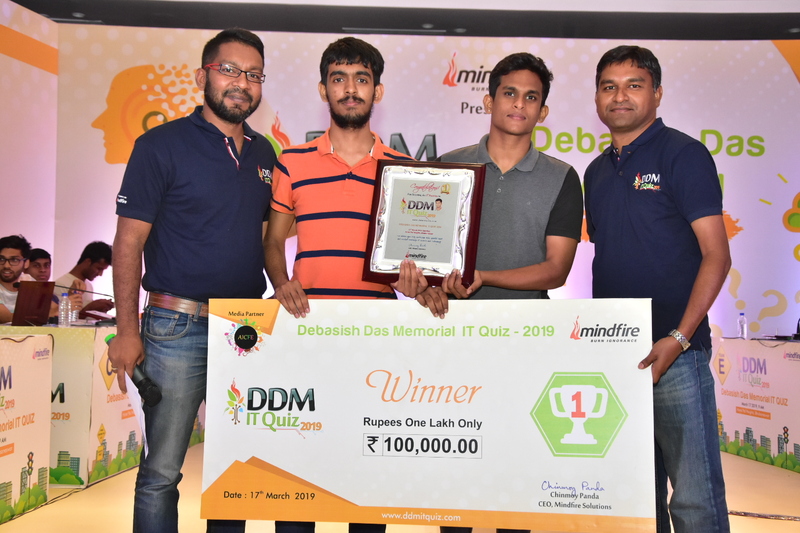 BHUBANESWAR : DDM IT Wiz, organised by MindFire Solutions, a leading IT services, consulting and business solutions, witnessed participation from students from various colleges in Bhubaneshwar. Over400 students participated in quiz held on Sunday, March 17, at PAL Heights, J/7, JaydevVihar Road, Bhubaneswar. Bhubaneshwar edition also witnessed colleges teams travelling from Delhi and Chennai for this years’ quiz. The Quiz has saw an overwhelming response from the participants this year, with more than 500 entries from pan India Master and Bachelor degree students studying in Management or Technical Institutes. Out of which 150 teams, each team comprising of two members from same college have reached to preliminary round before the best 8 team fight it out at the final round. Noted International Quiz Master Lloyd Saldanha has hosted the quiz programme. The Quiz platform looked into the technological trends that are poised to have huge traction across the globe. Students who are a part of this quiz would benefit from understanding these technologies as they walk into their future. Final saw a very tough fight amongst the participants, where they gone through six different rounds before the winner announcement. At the finals, G Pranav Hari and Rahul Humayun from IIT Madras, Chennai won the title. The Bhubaneswar Edition Champions this year walked away with an INR 1,00,000 worth Cash Prize while the runners-up represented by Abhisek Patra and Prathamesh Dash from NIT Rourkela were rewarded an INR 50,000 worth Cash Prize and Second runners-up represented by Vivek Prasad and Sayed Munib Ahamad from NIT Rourkela were rewarded an INR 30,000 worth Cash Prize along with a specially designed trophy and medals. The other participants present at the final also receive an array of prizes ranging from Power Bank, OTG pen drive, Earphones, T-shirts and Bluetooth speakers.